I have been carrying this image in my head since the winter. In December when my husband and I were driving home from Philadelphia we experienced a beautiful sunset against which the jewel toned colors of the lights sparkled. I took several quick photos with my iPhone while sitting in traffic. 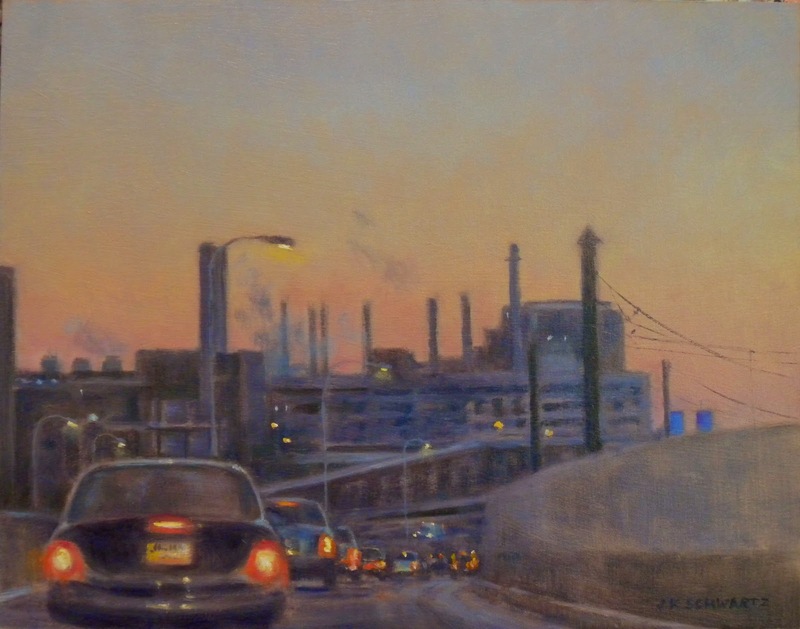 What drew me to this particular scene was the purple blue of the illuminated industrial buildings in the distance against the warm tones of the sky, the curve of sparkling car lights and the twinkle of lights from the open work of the complex directly ahead. I have never painted anything like this and I wasn't sure if I could. I became stuck nearing the finish on my 15th Street painting and decided it needed some closet time. I am not sure why this image flashed into my mind again but I suddenly had an urge to give it a go. I had a good panel at the ready which had already been toned with a mix of ochre and purple which I find a good base for nocturnes. So, I did a quick color study in my sketchbook and liked what I saw. I went right to work using that study and my iPhone photo as a reference. I finished it quickly and am quite pleased with it. I was in new territory and felt happy that I was able to pull it off considering I hadn't had the confidence to attempt it before. The image may not appeal to many due to the subject matter but I will be framing it and will look for an opportunity to show it! 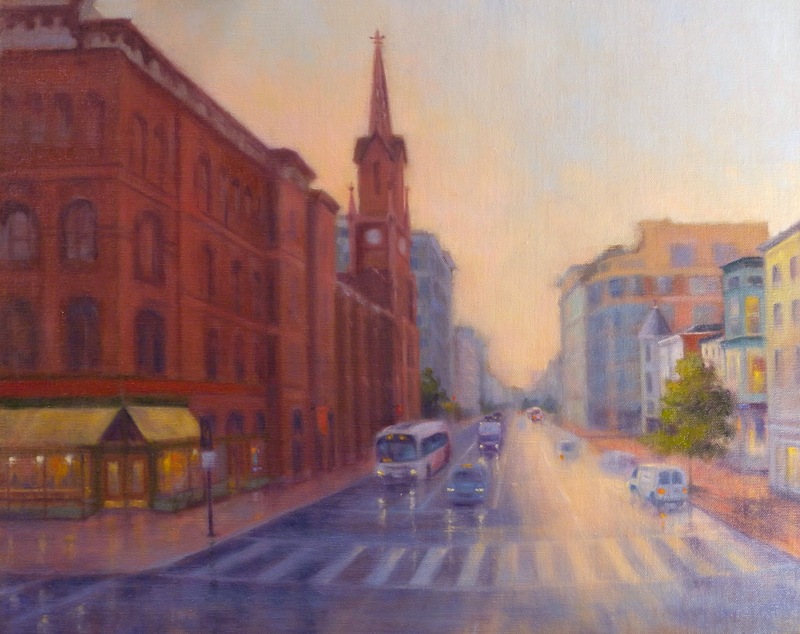 In Progress; "July Evening on H St."
This is what is currently on my easel and it is nearing completion. I apologize for the poor photo quality but it was taken in the dimming light and I have not edited it. We are having yet another evening thunder storm and I think we can safely label this monsoon season. It sure is wet out there! As I am typing this I am aware that the rain has ceased and we are experiencing the same lovely golden glow in the sky that I have pictured here. Mother Nature is being generous :-) We get to enjoy a sunny day, get a good dousing to keep things fresh and green and then are treated to a light show. This painting was inspired by this July weather. I have been in the mood to paint another cityscape so I chose H Street looking west as my subject rather than a landscape. Soon this view will be dated. Art historians ( Should I be so fortunate) will be able to date the painting as being pre H Street trolley. This deduction will be due to the fact that running down the center of H Street will be the new, bright red trolleys which are being delivered this month. I will have to do another painting of the same location when they are up and running. I think they will be a wonderful subject! I am still loving nocturnes! Here is another take on the subject where the light of the moon is present but not the moon itself. In preparation for this one I textured the panel rather heavily which gives a subtle movement to the atmosphere in this quiet painting. This one has been juried into the Noble Nocturne Exhibit at the Salmagundi Club at 47 5th Ave. NYC. The show runs from July 14th to July 25th in the newly renovated Main Gallery. 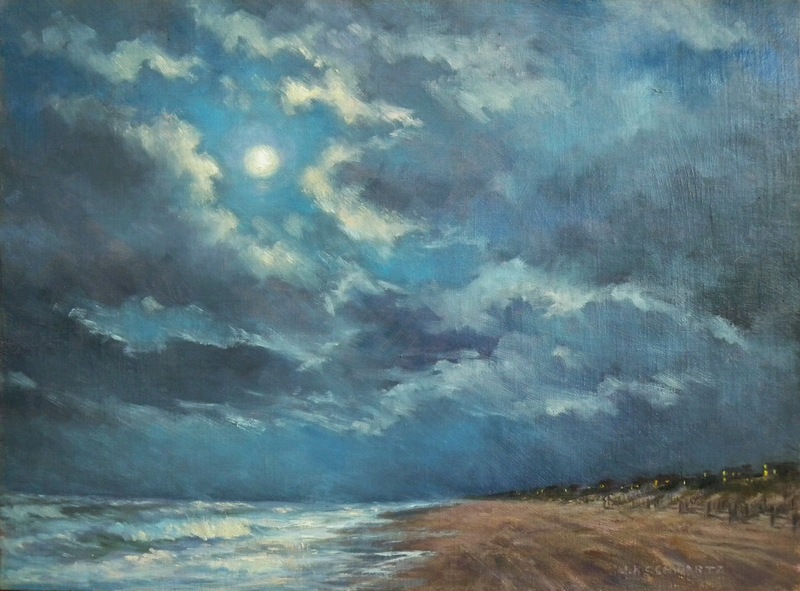 The artist reception will be the evening of Friday, July 18th and a special live nocturne painting demo will be given by artist member Anne Kullaf at 9:00 PM. Also accepted for this show is my painting from the last post which seems to have been blocked for some reason. I have changed the title to " When the Clouds Parted" and I will upload it again for this post. Please visit the Salmagundi atwww.salmagundi.org I know all the paintings in this beautiful show will be uploaded soon. On the easel; Another cityscape and this one is an evening painting. It is almost finished so I will post soon!